Michael Staebell is the District Director for the US Department of Labor, Wage and Hour Division in Des Moines. The Des Moines District Office encompasses Iowa and Nebraska. Michael has been with the Wage and Hour Division for 30 years, as an investigator in Des Moines and Waterloo, and in his current position. In addition to supervising the District Office staff, he regularly gives presentations to the public, and has served as a national trainer for Wage and Hour on the Fair Labor Standards Act, Total Quality Management, Family and Medical Leave Act, Litigation Preparation, and Investigator Basic Training. 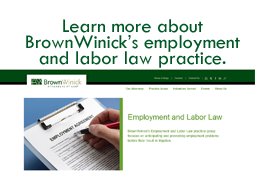 Michael will be discussing "Common Wage and Hour Issues and How to Avoid Them" at the Employment Law Seminar on Wednesday, October 15, 2014 at 9:05 a.m.
BrownWinick's Employment Law Seminar is held at the Hilton Garden Inn, 8600 Northpark Drive, Johnston, Iowa from 8:30 a.m. - 3:00 p.m. Space is limited. Click here to register.